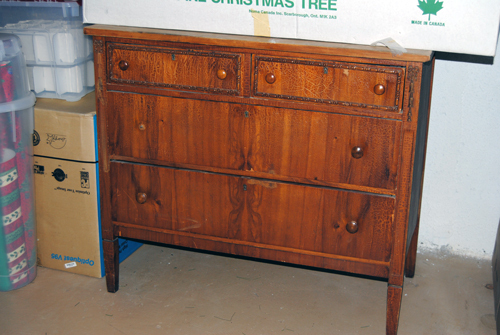 Most of our donated furniture needs very little work before it can be passed on to a new owner. 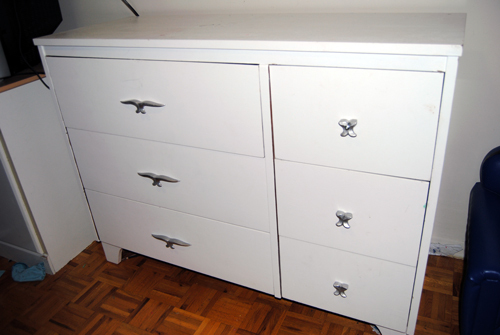 Mostly it’s an issue of cleaning it well and maybe replacing missing drawer pulls. Then sometimes we are given furniture that is decades old. 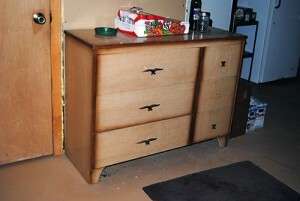 This is really good because old furniture is usually so well made and more likely to be solid wood. 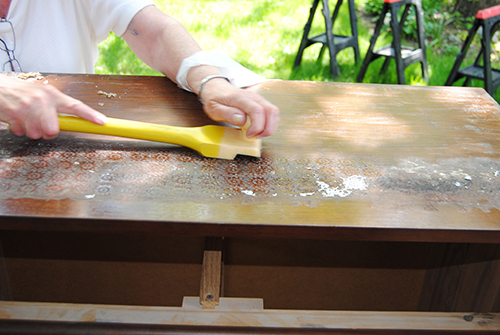 We scrape, sand and repair surfaces and then refinish or paint them. These examples demonstrate they are always worth the effort! 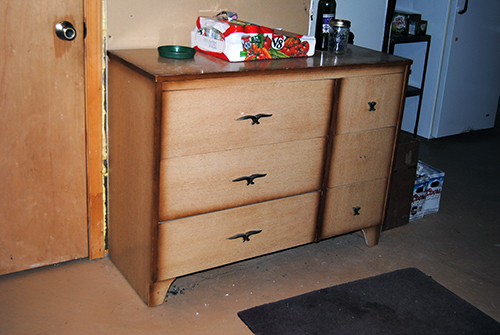 This sturdy mid-century dresser was perfect for our needs so sanding and painting brought it up to date. The drawer pulls were a little more challenging because the brass surface had begun to bubble in places. We cleaned them with TSP and water, and sanded to remove the bubbles. Then we finished the surface with 3 light coats of “brushed metal” spray paint. Tada! This solid dresser had gone from grandmother to granddaughter some 20+ years ago. At some point it had acquired a plastic rectangular doily, varathaned to the wood of the top surface. It took 2 sizes of scrapers to remove it but we got it all off. 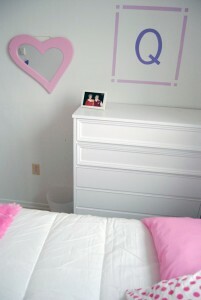 Then it was simple to sand and paint. 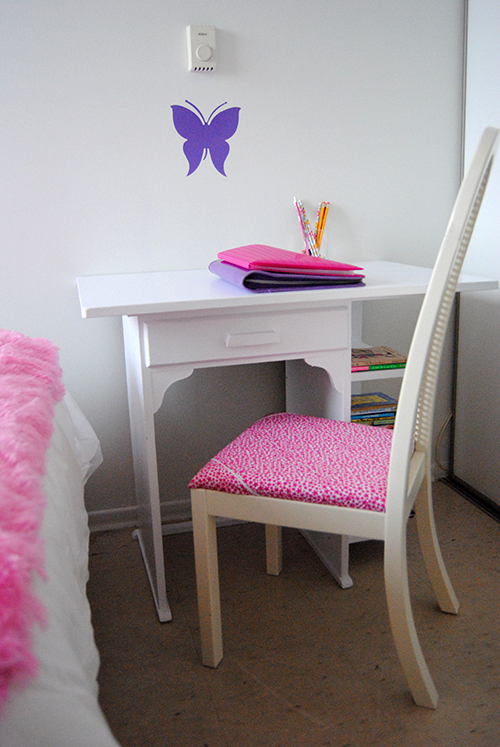 In its previous life this desk was sponge painted with green and purple paint by its creative young owner. With a little sanding and painting it became just perfect for its new “almost teenage” owner. 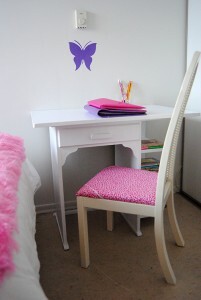 She likes to write poetry and plans to do so at her new desk. 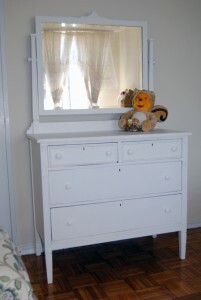 This lovely vintage dresser and mirror moved from basement storage to the highlight for a 10 year old girl. The dresser required a little extra prep due to the crackling of the old finish on several of its surfaces but it looked great on completion. Its young recipient did not own enough clothing to fill it so one large drawer is now for her out of season clothes and the bottom one holds her school books and supplies. She and her mom were both delighted.